Later this year, iOS 8 could give new meaning to the phrase "an Apple a day keeps the doctor away," as the iPhone maker is reportedly focusing on health tracking technology. Apple executives met with directors of the US Food and Drug Administration to discuss mobile medical applications last month, The New York Times discovered in the FDA's public calendar. The talks involved high-level Apple employees, including Jeff Williams, senior vice president of operations, Bud Tribble, vice president of software technology, and Michael O'Reilly, a medical doctor in Apple's government affairs department. The FDA meeting details haven't been disclosed, but combined with a report today about iOS 8, it suggests that Apple is going all-in with health monitoring in its next iOS update. Healthbook is supposed to be a pre-installed iOS 8 app that monitors and stores fitness metrics, according to unnamed sources who spoke to 9to5Mac. Its interface is said to match Passbook, but instead of accumulating digital tickets and coupons, it calculates steps taken, calories burned, miles walked and weight loss. These are pretty standard stat-tracking features that can be obtained from current wearables like the NikeFuel Band SE and Fitbit Force. The Healthbook report contains a "one more thing" style surprise when you factor in the unconfirmed iWatch, which is said to enhance this software with vital signs the iPhone is incapable of tracking. Blood pressure, hydration levels, heart rate and possibly glucose levels are additional metrics that could be introduced, according to 9to5Mac's sources. We're not sure how a wearable can keep track of hydration outside of a user manually logging every drink consumed, but when it comes to glucose levels, Google found a way in its smart lens prototype. Logging medication information is said to initiate helpful pill-taking reminders at scheduled times, a feature that could tie into the existing iOS 7 Reminders app. Apple's first foray into health monitoring came last year when it introduced iPhone 5S and its M7 coprocessor that could keep track of steps. 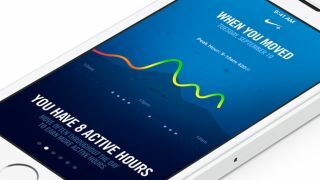 The company showed how Nike was integrating its Nike Fuel metric into the new phone and Fitbit has since expanded its app to use the M7 processor to log steps walked even without a Fitbit tracker. It'll be interesting to see if Apple works with or against Nike in realizing its health monitoring ambitions. Apple CEO Tim Cook is still on the sneaker company's board and Apple snagged at least Nike employee. Either way, this blip on Apple's radar last year could become the highlight of iOS 8 this fall if development of Healthbook gets into shape and joins the rumored iPhone 6 and iWatch in time.